Do Turf Soccer Fields Perpetuate Poor Soccer? In all seriousness though, despite some of its disadvantages (turf fields can get extremely hot and I hate seeing rubber pellets in someone’s open scab … that can’t be healthy), I think the modern turf fields are fantastic. However, watching my daughter’s team play an away game on grass (her home field is turf) got me thinking. Are turf fields perhaps doing the sport of soccer a disservice? I know many people, especially soccer purists, would agree with me wholeheartedly (most likely though not for the same reason). If you have visited my blog or have seen or used my soccer training device called Loopball, you know I am obsessed with ball control and the first-touch, specifically with the inside-of-the-foot. I believe that poor ball control and poor first-touches is the United States’ #1 problem in youth soccer today. Among other things, it results in a much more physical game as is evident in most high school and college games. Where the turf fields may be doing soccer a disservice is that it may take the challenge out of learning how to receive the ball with the inside-of-the-foot. On turf fields, balls kicked on the ground always roll true. There will never be any unexpected bounces or blips. When the ball is kicked in the air and bounces, unless there is some weird spin on the ball, a player will always know how the ball will rebound off the turf. Essentially, turf fields make it easier to receive and control the ball. My concern is that since it is easier to learn to receive the ball, players and coaches will not spend the necessary time needed to become comfortable with this skill. This is not a problem on natural grass fields (unless players should be lucky enough to have access to a professional team’s field). On grass fields, players are forced to learn and prepare for the unexpected bounces. As a result, they must spend more time on developing this skill and in all likelihood, will have a better first-touch. What players and coaches don’t realize is that the skill of receiving a ball can never be mastered. Professional players work on ball control and the first-touch all the time. With the ever-increasing popularity of turf fields, I just hope that players and coaches realize that while it may be easier to control the ball on turf, this skill still needs to be worked on continuously, preferably on grass and preferably on a field that is not in pristine shape. This is the third in a series of posts that discusses how to improve throw-ins. The first two throw-in posts covered checking in and throwing in to all areas of the field (all 180 choices). You often hear coaches telling their players to pass the ball on the ground. This is great advice. After all, it is easier to control a rolling ball than a bouncing ball. But what should a coach tell the player who is throwing in the ball from a throw-in? Rolling the ball is not permissible and passing the ball on the ground is impossible given the angle from which the ball is thrown. But if a coach were to instead instruct a player to pass the ball to a player’s feet, this instruction could apply to a throw-in as well. You want a field player to flick the ball with his/her head. Throwing the ball into an open space. Throwing a long distance throw to an approaching player. But for the most part, the player taking the throw-in should always aim for a player’s feet. Ideally the ball will land directly at the player’s feet. But as you can see in the photos below, there is some leeway. 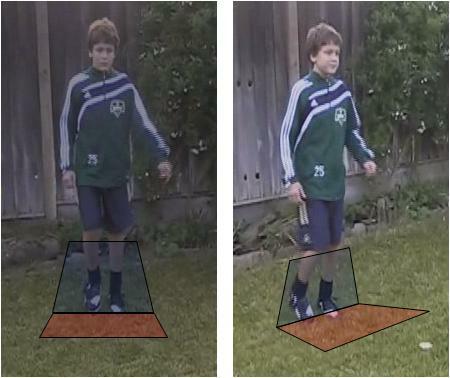 The ball can be thrown as high as the knees (transparent blue area) and up to a few feet in front of the player (transparent red area). If the ball is not directly at the player’s feet, it is expected that the receiver will make the necessary adjustments. There are many advantages to throwing the ball to a player’s feet. It is easier to control the ball. Players are used to and more comfortable controlling the ball with their feet when the ball is on or near the ground. A player has the best control stopping the ball with his/her feet. Pass back to the thrower. Beating a defender with a quick move. Throwing the ball accurately is much easier said than done. Most throwers are conditioned to throw the ball down the wing as hard as he/she can. Now when a player is running at them, it becomes a challenge to time the throw with the player checking in. What also tends to happen is when a thrower tries to take a little pace off the throw-in, the throw-in technique changes enough (i.e., the ball is not placed behind the head) to result in a foul throw-in. If you read my other throw-in posts, I’m not a big fan of working on throw-ins during practice. This is in large part the result of seeing many coaches spending too much time on throw-ins. However, I am a fan of making sure that the game of soccer is played and taught properly. I also believe that when a team is in possession of the ball, they should take advantage of the situation and not just give the ball away. With that in mind, the following exercise will help players develop more accurate throw-ins and also reinforce the act of checking-in. Team up players in pairs. To warm up, have the two players stand 5 yards apart. Have them throw the ball back and forth to one another (Scenario A) using proper throw-in technique. Next, have them move 10 yards apart. Have the receiver break toward the thrower (Scenario B). The goal is for the thrower to time the run and throw the ball at the advancing player’s feet. Have the receiver control the ball, pass it back, and then return to the 10-yard spot. Repeat this 5 times and then switch the thrower and receiver. Repeat this same exercise at 15-yards apart (Scenario C) and 20-yards apart (Scenario D). Good throw-in technique is used (hands behind the head and both feet on the ground). The players make eye contact with one another and the receiver calls for the ball. The ball lands at the receiver’s feet or within the designated area. The receiver controls the ball properly. The receiver breaks away quickly from the imaginary defender. The receiver passes the ball accurately and with the correct pace back to the thrower. The receiver returns quickly to the prescribed starting spot and repeats the check-in (this is a great conditioning exercise for the receiver). Remember that the player receiving the throw-in does not always have to pass the ball back to the thrower. When the ball is passed back, I often see the thrower simply kick the ball up-field without much thought. In my opinion, this action is just as bad as throwing the ball down the wing. The player receiving the throw-in should always be aware of the defender’s and his/her teammate’s positioning. Based on this information, the receiving player has many options after controlling the ball. Make sure towork on these options and incorporate them into the exercise above.